1. 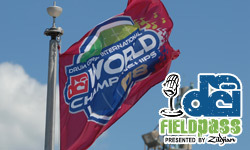 Your season-capping Field Pass Aug. 15, 2008: What was it like on the field when the scores were announced at the World and Open Class World Championship Finals last weekend in Bloomington? 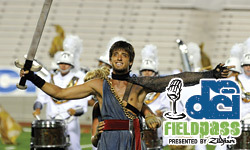 Hear all of the reaction from members and instructors of Phantom Regiment and the Vanguard Cadets. Listen to this Field Pass episode. 2. Introducing the Hall of Fame Class of 2008 April 16, 2008: This past weekend, the votes of Drum Corps International World Class directors and Hall of Fame members were tallied to select four new members who will be inducted into the DCI Hall of Fame for 2008. 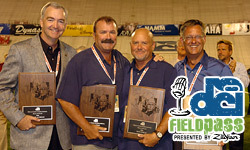 In this special edition of the Field Pass, host Dan Potter interviews Hall of Fame Chairman David Kampschroer ('85) to reveal the four newest members representing the Hall of Fame Class of 2008. 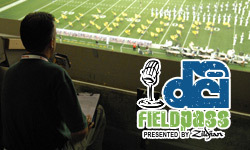 Listen to this Field Pass episode. 3. 'Spartacus' then and now June 25, 2008: Phantom Regiment's 2008 version of "Spartacus" is a departure from the way the corps originally staged Aram Khachaturian's ballet in the early 1980s. Dan Potter has more on the "Spartacus" then-and-now in today's Field Pass presented by Zildjian. 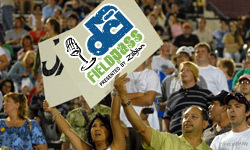 Listen to this Field Pass episode. 4. World Championships kick off in Bloomington Aug. 7, 2008: From the stadium concourse, to the field, to the television truck broadcasting "Big, Loud & Live 5" into more than 340 theaters across the country; Dan Potter gets around all the action at Thursday's World Class Quarterfinals from Memorial Stadium in Bloomington, Ind. All this, a look back at Wednesday's Individual & Ensemble competition, a visit to the Jersey Surf rehearsal site, and much more in today's Field Pass presented by Zildjian. Listen to this Field Pass episode. 5. DCI judging no holds barred As competition heated up in Memorial Stadium during the World Championship Semifinals events on Friday, Dan Potter sat down with DCI Judge Administrator John Phillips for a frank discussion on three buzz words sometimes associated with judging: slotting, politics and bias. 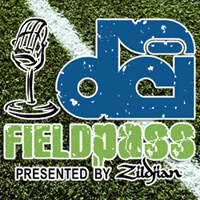 Listen to this Field Pass episode.